TIRANA - Albanian Archbishop Anastasios knows about rebuilding churches from nothing. He began his leadership as Orthodox Archbishop of Tirana, Durrës and all Albania in 1992, shortly after the State that had banned all religion began ditching communism. He told global church leaders that the deception and slander during the period of persecution in once isolated Albania was not its exclusivity but was particularly severe during the 20th century. The Global Christian Forum assembled top church leaders in Albania including the Cardinal Kurt Koch, Pope Francis' representative on ecumenical relations, World Council of Churches head, Rev Olav Fykse Tveit, his counterpart from the World Evangelical Alliance, Rev. Efraim Tendero and Rev. David Wells representing the Pentecostal World Fellowship. Some of the Christian representatives at the 1 to 5 November meeting had come incognito fearing repercussions in their repressive home areas. 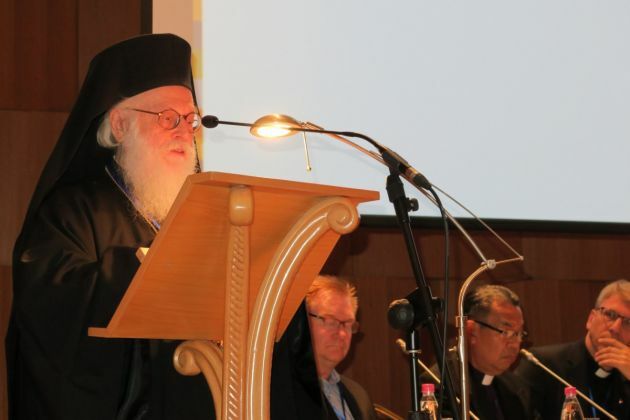 "In the last century during the duration of the relentless atheistic persecution, which brought Albania into a deep spiritual darkness, the discrimination against Christians and martyrdom reached its high point," Anastasios said in a keynote address. He recounts the story of a Fr. Jorgios an Orthodox priest in a village in the South of Albania who was a teacher and also an agriculturist. "When the communist persecution broke out, he was forced to leave his priestly duties and to labor as a road construction worker." One day he stopped for a break from the gruelling work in the hot sun, a friend of his, a faithful Christian from another village, approached and whispered to him Christ's words: 'In the world you have tribulation.'" Fr. Jorgios raised his eyes calmly and continued the verse: "but be of good cheer, I have overcome the world," (John 16:33) recounted Anastasios. He noted how at an another time, fanatical followers of the communist party engraved a big cross in the middle of the road and compelled Jorgios to step on it. The priest devoutly kneeled, spread out his hands on the cross and embraced it. "Subsequent actions such as exiles, hardships, long-­‐term imprisonments, and executions of clerics, laity, and entire families followed," said the Albanian Orthodox leader. Anastasios noted that such persecution did not happen only in Albania. "The 20th century is full of moving stories of faithful people, who have paid for their dedication to Christ through terrific tortures and executions," said Anastasios. "However, even in our century, wherever antichristian powers prevail, various persecutions continue against Christians." But the most notable martyr was Jesus with his apostles following him and they had warned of what followers might have to endure. "The constant point of reorientation and comfort of the faithful was the ceaseless contemplation of Jesus Christ," said Anastasias referring to his childhood threat by "King Herod's mania" and his hostility to the Pharisees and the Scribes. "The Cross became the Christian symbol par excellence; together with the Resurrection, it forms the DNA of the Church." Anastasios told the church leaders assembled," The Church was founded on the glorious martyrdom of Christ." In the modern world Christians live in a complex world that is characterized by pluralism and interdependence. "In the modern, globalized world we are indebted to increase our sensitivity, vigilance, solidarity. Christians are a majority in some places, a minority elsewhere," the Albanian archbishop who has played a leading role in the World Council leadership over many years said. "They are often oppressed in various ways, as is happening in our time in the Middle East, in Africa, and in Asia," said Anastasia. That is why Christians living in free countries carry a huge responsibility. "We cannot remain indifferent to the sufferings of our brothers and sisters. We must use our vote to influence rulers. "We are obliged to raise our voice by any means available, to protect, to actively support our persecuted brothers," noted Anastasios referring to the Apostle Paul who clearly defines our duty. "If one member suffers, all suffer together; if one member is honoured, all rejoice together." (1 Cor. 12:26) In carrying out its task, said Anastasios, the Church "must remain open to the pursuits of humanity, faithfully following the path outlined by Christ."